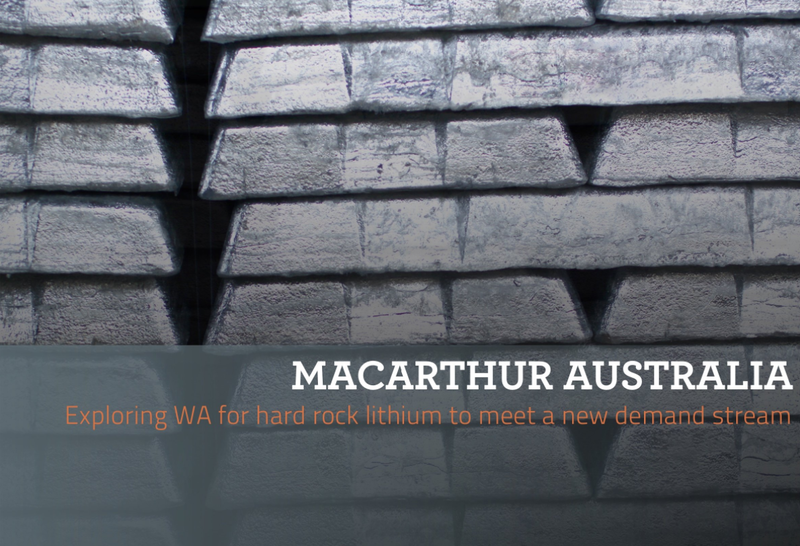 Backed by TSXV-listed Macarthur Minerals, Macarthur Australia is a new venture focused on exploring and developing hard rock lithium in the Pilbara, one of the most prospective regions for new lithium production in Australia and possibly across the globe. Macarthur Australia is raising up to A$10 million to raise funds to build on exploration for its huge land package in Western Australia, it comes through the form of up to 50 million new shares at $0.20 each. Lithium is going through a purple patch as electric vehicle production is ramped up and the predicted supply/demand mismatch takes hold in the next decade. “I went to a conference last year and it was predicted that one new lithium mine will have to come online every year for the next 10 years just to keep up with current demand,” states Macarthur Australia’s CEO David Taplin, who has identified lithium as a strategically critical resource for the world moving forward. As well as a holding a huge land package of around 1,870km2 across Western Australia, a position Taplin outlines as one of the largest land packages for lithium exploration in the Pilbara, Macarthur Australia also owns the Ularring project, an asset which has had $60 million spent on it in exploration and development and now sits with an inferred resource of 25.99mt @ 45.4% Fe. However, with the demand/supply indicators for lithium, as a key component in lithium-ion batteries and their clean energy storage, Macarthur Australia’s lithium package will be the primary focus to push through exploration. “We’ve got one of the largest areas for lithium exploration in WA. With Macarthur Minerals we have over 2,400km2 for exploration, with so many areas we will focus on the most economic project as we continue our exploration efforts,” explains Taplin. While the South American lithium brine deposits are the traditional home for the white metal, Western Australia is taking up the mantle as the centre of hard rock lithium carbonate production to meet the demand coming from China particularly as the country endeavours to bring down pollution in its cities through EV production. “I fundamentally believe in the supply and demand parameters for lithium. Lithium for lithium-ion batteries and production is currently in a shortage of supply and the demand is being driven by clean cities in Asia and the production of electric vehicles by car companies around the world,” notes Taplin. “All the major car companies around the world are working on electric vehicles. I believe in the near future China will set quotas for electric vehicles and is already the largest buyer of electric vehicles in the world. Demand in Europe is likely to spike as well as in Asia, with Volkswagen recently predicting that 25% of cars built in 2025 will be electric vehicles and the German government committing to banning sales of internal combustion cars by 2030. Therefore, it is crucial that Macarthur Australia can identify and develop a high grade lithium resource to meet the rising tide of demand and time it with the lag in supply. The explorer is going to undertake extensive sampling to identify drill targets across its exploration licences before pursuing a maiden drill programme. “We have a very large area with potentially multiple projects and we’re going to seek to develop the best resource. Our primary focus is on conducting exploration to develop an economic resource for lithium. We want to progress the company along a similar pathway to that followed by companies such as Pilbara Minerals and Altura Minerals,” says Taplin. Taplin adds that the predicted market conditions for lithium is likely to bring with it a new wave of capital for exploration and development. “There’s strong appetite for lithium [in the market]. While it is a boutique metal, not a bulk commodity like iron or coal, the price is high and the margins are high which means it’s quite attractive. “The strong global demand for lithium has been reflected in the interest in our IPO,” the IPO is due to close at the end of June and a quotation in mid-July. After that Taplin says it will be all cylinders go as Macarthur Australia looks to bring forward the lithium assets alongside assessing the iron ore project. “Firstly, we need to complete the IPO and listing on the ASX. Then undertake exploration on our lithium project and continue on our work of developing options for building on our iron ore project. “We also have projects in Nevada, which is a lithium brine project, owned by Macarthur Minerals and we will continue exploration at that project. It’s strategically located in Nevada where the [Tesla] Gigafactory is being built.